How CLOUD 9 PHOTOGRAPHY Benefits You—the Customer! 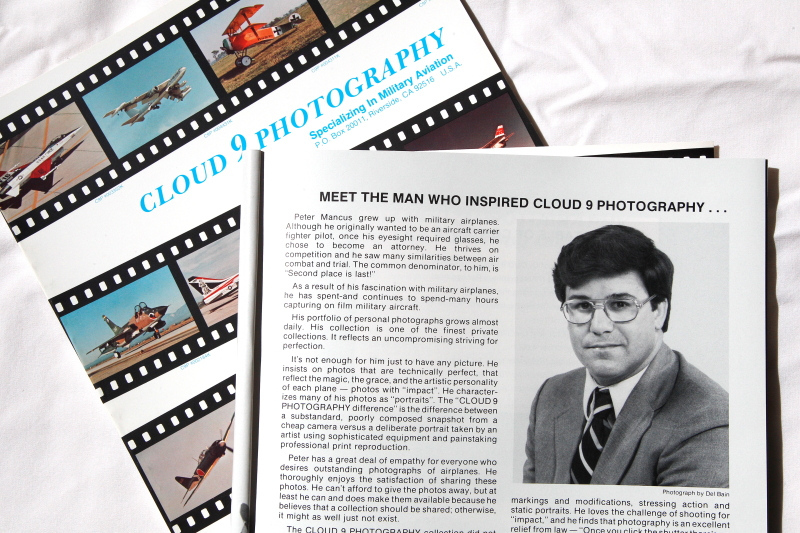 This document answers a key question: Why should anyone do business with CLOUD9PHOTOGRAPHY.US? The checklist below tells you what's in it for you-the customer and what are the major differences between CLOUD 9 and its competitors. FACTOR NO. 1: You are why CLOUD 9 exist, and I treasure you. At CLOUD 9, I am focused on the customer: You. I genuinely treasure CLOUD 9's customers, care about them, help guide them to make intelligent decisions, and treat them well. I understand that, without loyal, repeat, hyper-satisfied customers who are evangelists for CLOUD 9, I cannot grow and will not survive. Thus, I believe that selling is serving, and the best way to accomplish my goals is to provide you excellent personalized service coupled with a highest quality product at a fair price. Consequently, I am ready to be of service and to answer your questions, competently and cordially, to achieve your full satisfaction. I put your first, and I seek to build a long term relationship with you, based on trust, honesty, full disclosure, responsiveness, fair pricing, and a high quality product. FACTOR NO. 2: I have done everything humanely possible to remove fear, if any, and to make doing business with CLOUD 9 convenient, easy, safe, and enjoyable. Many of our pictures are scarce and many are associated with significant symbolic meaning and deeply felt emotions. Consequently, when you receive a defect free, high quality, large, detail rich, CLOUD 9 print, we deliver to you an experience that benefits you. That experience creates value beyond mere satisfaction: it creates a happy feeling of excitement and delight. It also compliments your lifestyle, your values, the meaning of your life, and it says something about what you stand for, what you value, and what are your aspirations. To summarize, we deliver what we say we will, namely, a superior product at a reasonable price with a guarantee, dependable service, and no aggravation, so your buying experience is a flawless transaction, and that is the truth without any trick. Consequently, when you press the "Order Now" button, you can do so with confidence, because I will do the rest. I also stress that I control the entire print manufacturing-to-sales process, I personally make, inspect, and approve every CLOUD 9 print sold before it is shipped, and I am persnickety. FACTOR NO.3: I am ethical. I adhere to the highest ethical standards, practice "the Golden Rule", tell the truth, and, when I make a mistake, admit it. I never put my desire to make money before my commitment to serve you well. I also shun all forms of puffery, I can back up every objective claim I have made, and I have not substituted vagueness for puffery. FACTOR NO. 4: I have credentials. 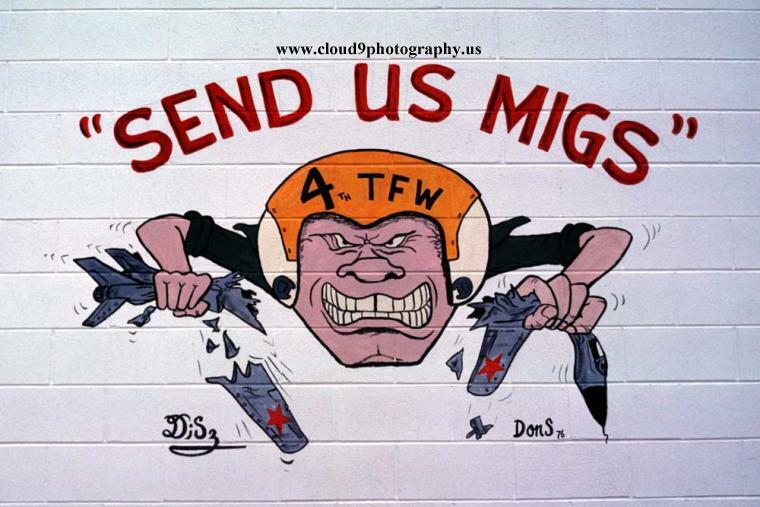 CLOUD 9's pictures are real. You can see them. They are believable. I am an experienced, talented, skilled, accomplished, published, photographer who is blessed with a good "eye". I have 1) earned U.S. military "back seat cards"; 2) flown in military jets and helos, doing air-to-air photography, 3) embarked on U.S. super aircraft carriers, photographing U.S. 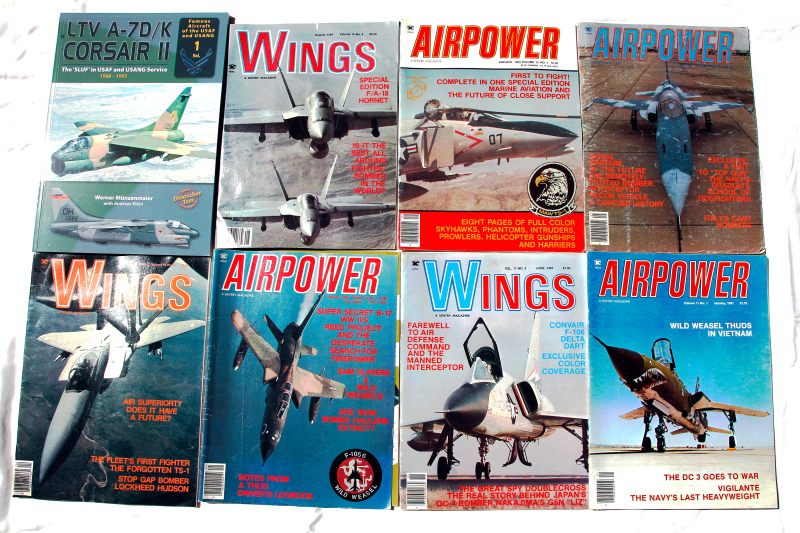 Naval Aviation at sea, 4) covered, for years, many major U.S. military training exercises, 5) scored published magazine and booklet cover shots and center spreads, 6) licensed a businessman who sold many of his pictures in the form of hundreds of thousands of posters, 7) been published in numerous military aviation enthusiast publications, 8) had my pictures displayed at major U.S. air bases, 9) created an impressive, large, body of work that is a major, high quality, photographic data base of military and civilian airplanes from 1970 to date, and 10) is often the first in my area to implement and hone new, creative, ideas. 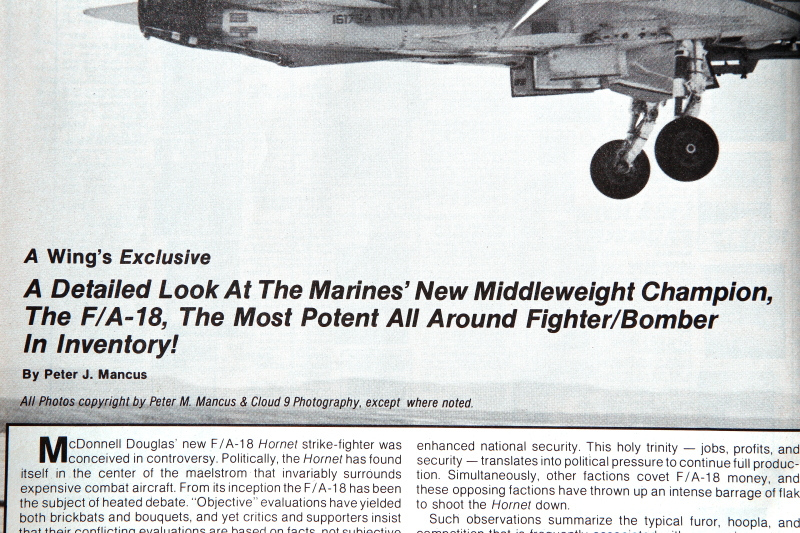 CLOUD 9, therefore, is owned and operated by a person who has an enduring love for airplanes, photographs them well, and knows his way around photography. FACTOR NO. 5: Content is king, and we have lots of it, which means you have a big selection from which to choose. A. CLOUD 9 has rare content. When it comes to our airplane pictures, CLOUD 9 specializes in rare color schemes, rare modifications, unique angles, comprehensive coverage, action, the world's major and minor air forces, airliners, warbirds, and an obsessive pursuit of quality. CLOUD 9 has many colorful airplane pictures that are forty to sixty year old; some are real World War II color. Approximately 65% of the airplanes in CLOUD 9's collection no longer exist, but we have excellent pictures of these airplanes. B. CLOUD 9 has extensive high quality content-second to none. On a scale of one to ten, ten being best, CLOUD 9's average airplane picture is an eight. Many are a ten-a zinger. A zinger is a picture that commands attention. These are so good you'll be proud to show them to your friends, collect them, study them, decorate with them, and give them as unique gifts. C. I give my customers a wide range of choices. CLOUD 9 offers all of the following:1) large, professional grade, color and B&W prints, with a money back guarantee, 2) a comprehensive, in depth, selection of many airframe types, and 3) different aspect ratios [cropping] print sizes, including multiple rectangular sizes and square sizes. D. CLOUD 9's content has become so comprehensive that we have started multiple sub-galleries and we are filling them as fast as we can. E. It is often possible for a person who is looking for an exact serial number of an airplane that a relative flew or worked on to find on CLOUD 9 an excellent picture of that exact airplane! 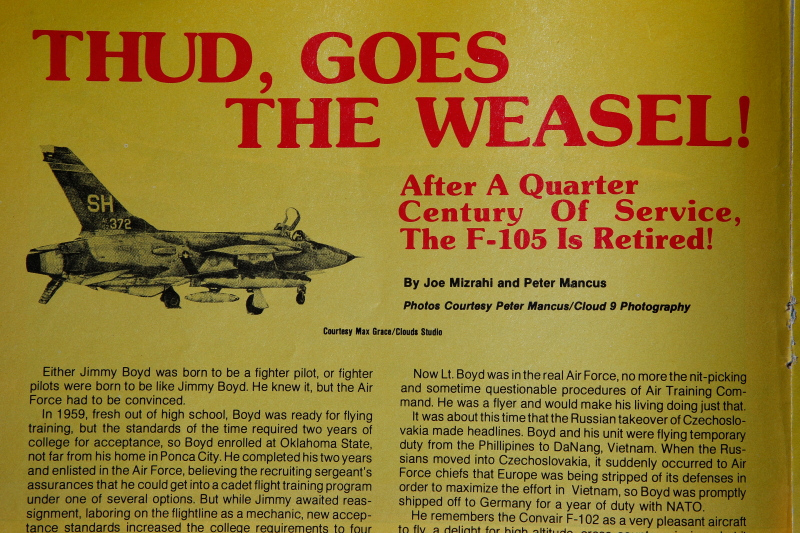 A relative who can give another relative or a friend a picture of the exact airplane the relative or friend flew or worked on can give an unique, thoughtful, hard to find, gift to a special person. The ability to do that creates joy-enduring joy, for the giver and for the recipient of the gift, and that joy triggers a priceless, "I'm happy and on Cloud 9" feeling. I love to be able to provide this service. F. CLOUD 9 offers different styles of photography. CLOUD 9's primary picture styles include: 1) static, side profile, clutter free, strong sun light, 2) dynamic action-loose crop for context, 3) dynamic action-tight crop, for high impact, 4) "arty", 5) night photography, 6) wide angle, 7) moderate telephoto, 8) extreme telephoto, and 9) macro extreme close-ups. G.	90% of CLOUD 9's prints are pin-prick sharp and you can see and enjoy the lush, rich detail most people never see in small prints. Most people cannot appreciate "the CLOUD 9 difference" because they have not seen pictures this good in high resolution, large format. H. CLOUD 9 has valuable content. The economic and collector value of our airplane pictures increases as these airplanes become distant memories and high quality images of them become hard to find and the lack of supply drives up prices. I. CLOUD 9 has no built-in obsolescence. Our prints will never become obsolete. Instead, they will become valuable with the passage of time as quality pictures of airplanes that no longer exist become harder to find. J. I periodically add fresh, current, images. Our galleries will never become stale. This is because many of CLOUD 9's contributing photographers continue to contribute wonderful images. K. I cater to serious model builders. 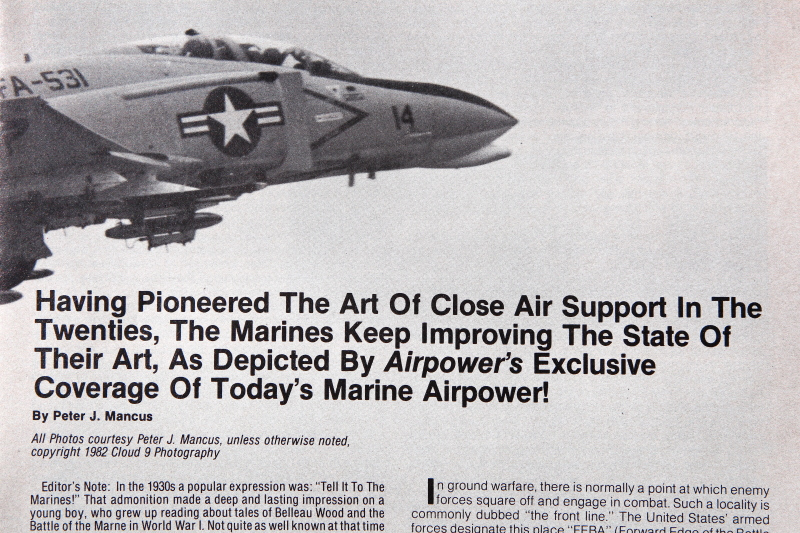 CLOUD 9's airplane pictures are "the real deal"-real airplane pictures of authentic, rare, airplane markings and modifications. 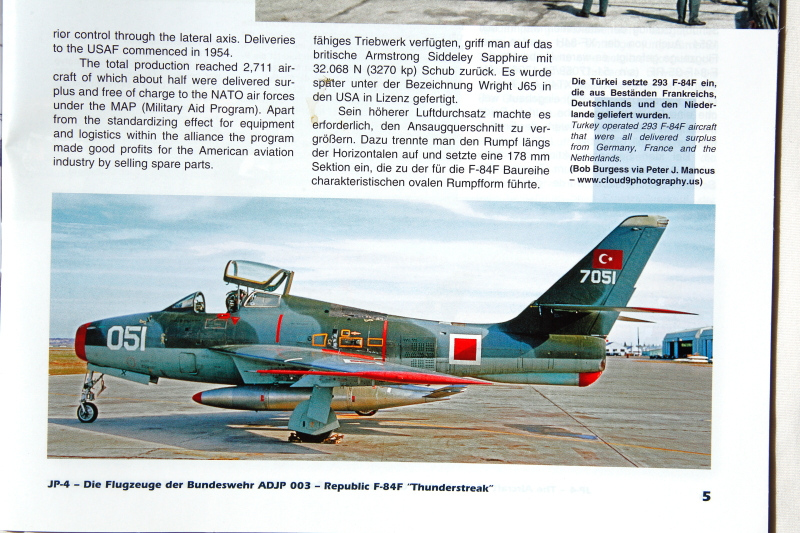 When we have pictures of both sides of an airplane, we post them to help out modelers who need real pictures of both sides of the airplane that is the subject of their model. 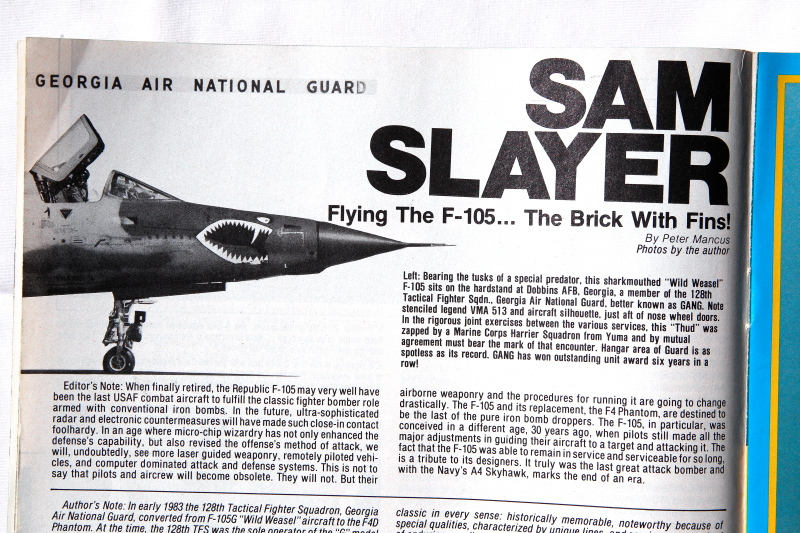 L. I also cater to serious collectors of military aviation history. A review of CLOUD 9's airplane pictures proves that over the years people have painted unusual, creative, beautiful, artistic, things on airplanes-from the garish to the pragmatic. 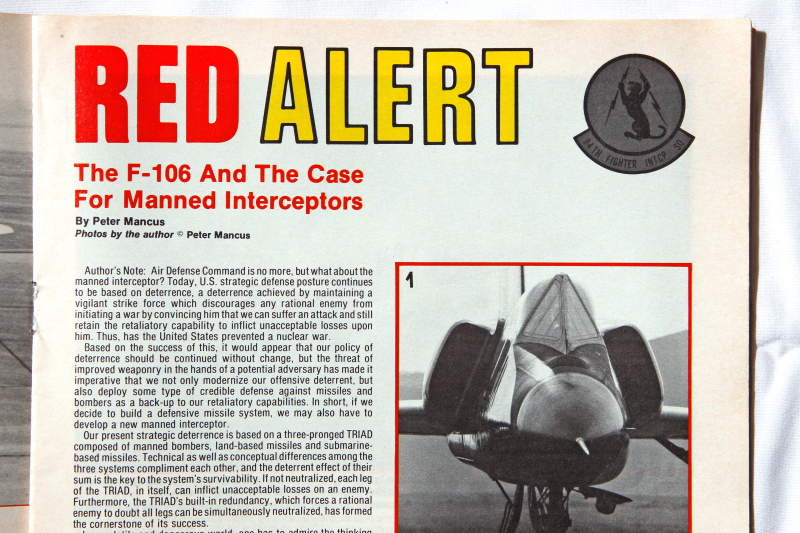 These markings have created sub-categories for collectors: Bicentennial, Combat Art, Nose Art, Day-Glow, MiG Kills, Sharkmouth, Tiger Stripes, Birds of Prey, Predator Big Cats, Animals, Tail Codes, and Squadron or Event Anniversary Markings. We have an extensive photographic record of this priceless paint. 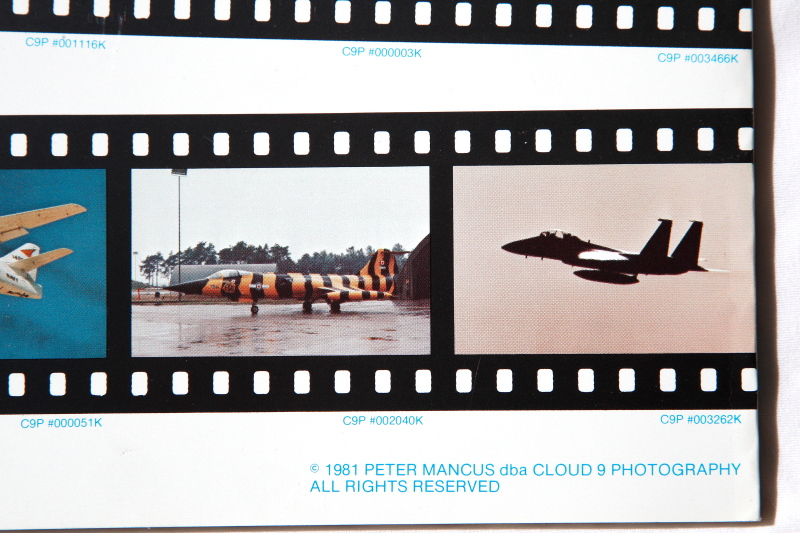 For some individual airplanes, we also have a photographic record of them in multiple color schemes or in service with different squadrons or branches of the U.S. Armed Forces. M. CLOUD 9's galleries are priceless treasure troves. 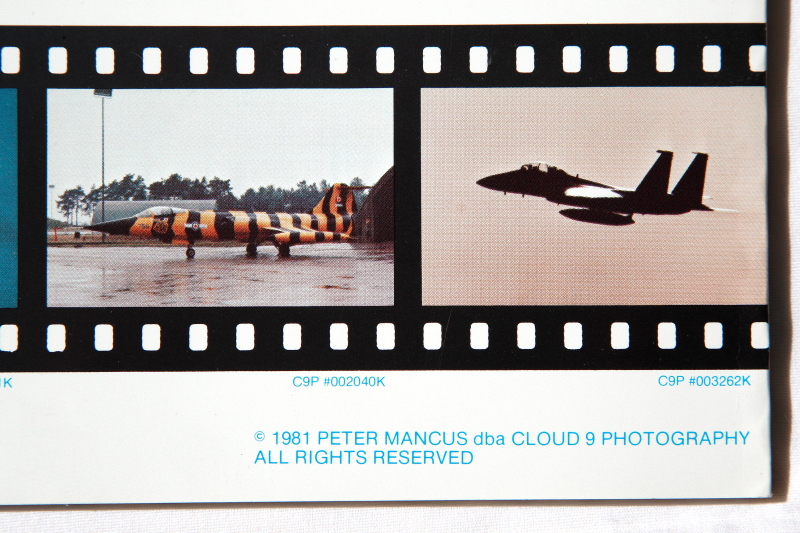 For all who desire a reliable source of large, beautiful, and technically perfect airplane pictures, CLOUD 9 is a convenient treasure trove or a giant, on line, museum or catalogue full of priceless oddities and curios, as well as the common-place photographed superbly. FACTOR NO. 6: I control a large percentage of CLOUD 9 images. Since I am the only source for many of CLOUD 9 images I have a monopoly on them. FACTOR NO. 7: CLOUD 9 prints are excellent for wall decor. If you have a special den or retreat in your home or office, or a conference room or a lobby, that you want to decorate-and make a haven or a sanctuary for your enjoyment, one or more of our large prints are excellent as unique wall decor. FACTOR NO. 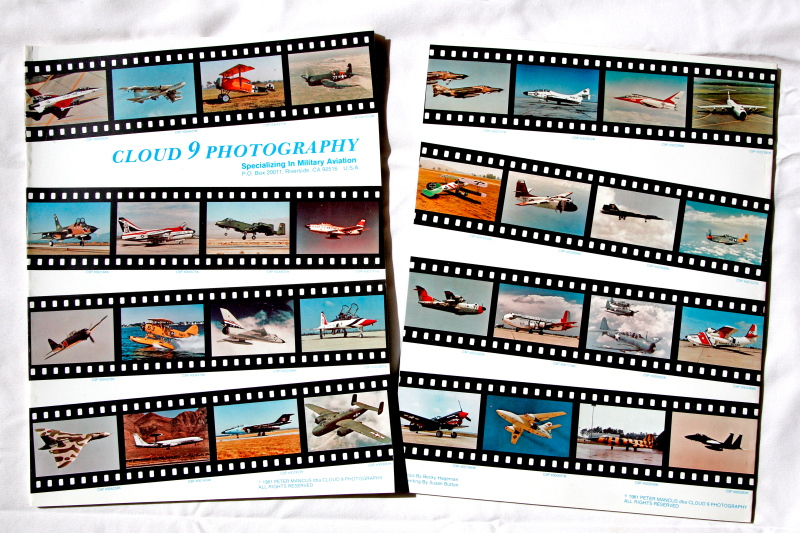 8: CLOUD 9 prints make excellent gifts. CLOUD 9 has excellent pictures on a wide variety of subjects that appeal to many people. Our wildlife pictures, for example, are excellent, and we have a growing excellent line of maritime photography. A wife, mother, daughter, or aunt can give to a significant man in her life a wonderful, unique, gift-one he never knew he wanted or expected-spreading joy, creating that precious, long remembered, "up on cloud 9 feeling". Conversely, a husband, father, son, or uncle can give to a significant female in his life a wonderful, unique gift-one she never knew she wanted or expected-also spreading joy, creating that precious, long remembered, "up on cloud 9 feeling". FACTOR NO. 9: CLOUD 9 prints are an affordable, quality purchase, a small indulgence that will not overburden you with debt or guilt. It is impossible for you to indulge yourself on junk when you buy a CLOUD 9 print. FACTOR NO. 10: CLOUD 9 has a solid foundation. I have built CLOUD 9 upon this foundation: 1) content is king . . . and I have excellent, rare, content; 2) high quality; 3) reliability; and 4) good service. FACTOR NO. 11: CLOUD 9 has staying power. CLOUD 9 has been in business from 1981 to, date and it has been on the Internet from 2005 to date. FACTOR NO. 12: I have a "long haul" intent. I, as CLOUD 9's owner, plan on being around, for years. FACTOR NO.13: CLOUD 9 has a responsive Complaint Department and Suggestion Department. If you have a problem when dealing with CLOUD 9, there is a real person to hold accountable, to complain to, to turn to for help, and to trust: Me, CLOUD 9's owner, Peter J. Mancus. I am an up front, candid, type person who will never avoid you or hide from you. I am also eager to benefit from your suggestions and candid feedback. My full contact info is stated below. FACTOR NO. 14: I am intelligently responsive to change and new technology, and CLOUD 9 continues to improve. One example is this: I now have the ability to take sharp, dynamic action, attention commanding, pictures . . . at night! Another example is this: I have upgraded our printer to an even better one, with cutting-edge technology, and we are now able to sell excellent color and B&W prints. Another example is this: When I scan 35 mm film, I use a professional, dedicated film scanner, at 8,000 DPI in 16 bit, which makes a digital file for each scan that is almost one half of a full Gigabyte, and that is huge. FACTOR NO. 15: I don't skimp on what is important. FACTOR NO. 16: I am proud of our prints and have confidence in them, so much so that I offer a money back guarantee with a generous 60-day return period. FACTOR NO. 17: I am a specialist in certain niche markets, and I excel within those markets. A. I have become a successful specialist. I do not mass market CLOUD 9 prints, e.g., I do not make huge quantities of the same product for everyone and then shout features and benefits. Instead, I focus on highest quality and give customers a chance to participate in the creation of customized products for them-just them. By focusing on what I do extremely well . . . and sticking with it, I have become a successful specialists. By refusing to try to be all things to all people, I serve my niche markets extremely well. B. CLOUD 9's customers enjoy doing business with us. CLICK HERE to read some of CLOUD 9's customers' testimonials, which underscore what is "the CLOUD 9 difference". Many of our customers have made us their preferred provider. FACTOR NO. 18: CLOUD 9 has an easy to navigate Internet site that is well organized and makes finding certain images easy and quick. We have well labeled galleries and sub-galleries. With a few clicks of the mouse you can quickly "drill down" and find what you are looking for, if we have uploaded it. FACTOR NO. 19: I really am persnickety. My goal is uncompromising quality and perfection, and I often achieve perfection. In an age of glitter, plastic and throw-a-way values, I steadfastly believe in an enduring, value: Extremism in the Pursuit of Excellence. The prints you receive from CLOUD 9 will satisfy your most exacting standards. I reject mediocrity, will never compromise on quality, and will never stop being persnickety. FACTOR NO. 20: Price is not my main consideration. Anyone can mark down a price by producing an inferior product. I, however, refuse to compete based on price alone. This is because high quality is still the only real "true value", cutting prices to compete is a prescription for failure, and product quality and excellent service should sell the product, not temporary price cuts. FACTOR NO. 21: I do not have periodic sales with discounted prices. FACTOR NO. 22: I have an unwritten "Customer Loyalty Program". I have an unwritten intent, based on my sole discretion, to reward good customers with unscheduled special promotions for them alone,, advance notices, and freebie prints for loyal, repeat customers. I subjectively measure customer loyalty based on RFV, namely, Recency, when did a customer last buy from me, Frequency, namely, how often does a customer buy from me, and Value, how profitable am I and how much can I prudently afford to give back to my best customers. FACTOR NO. 23: Volume discount prices are possible. If interested, please call me, CLOUD 9's owner, Peter Mancus, at (707) 824-1884 to discuss. FACTOR NO. 24: CLOUD 9 prints are "a star". People who see CLOUD 9 prints are impressed, and it is common for them to say they did not know that a print that big could look that good. FACTOR NO. 25: CLOUD 9's prints are a source of on-going joy. CLOUD 9's prints trigger serene joy-which is a priceless feeling, great for the mind, the heart, and the soul. FACTOR NO. 26: CLOUD 9's prints are excellent for education, fascination, and stimulating wonder and dreams, akin to a taking a safe, fantasy-like adventure. A close look at CLOUD 9's airplane pictures is a fascinating look into the past and the present of aircraft development, color schemes, and markings. Via CLOUD 9, you can experience a B-17 flying on a mission against Nazi Germany; or stand alongside a Sopwith Pup replica nesting in a field during the Great War; or feel the thrill of flying an F-16 Fighting Falcon "Viper" in afterburner, loaded with missiles and bombs; or you can marvel at a huge B-52 Stratofortress "Buff" taking on thousands of gallons of fuel during a mid-air refueling-the great ballet in the sky; or savor the excitement of flying with a TOP GUN F-5E Freedom Fighter, over a bed of clouds, the same sight you'd see if he were your wingman! Our images have captured and memorialized slices in time. Thus, our prints are a way to "buy back" time and "witness" the past. FACTOR NO. 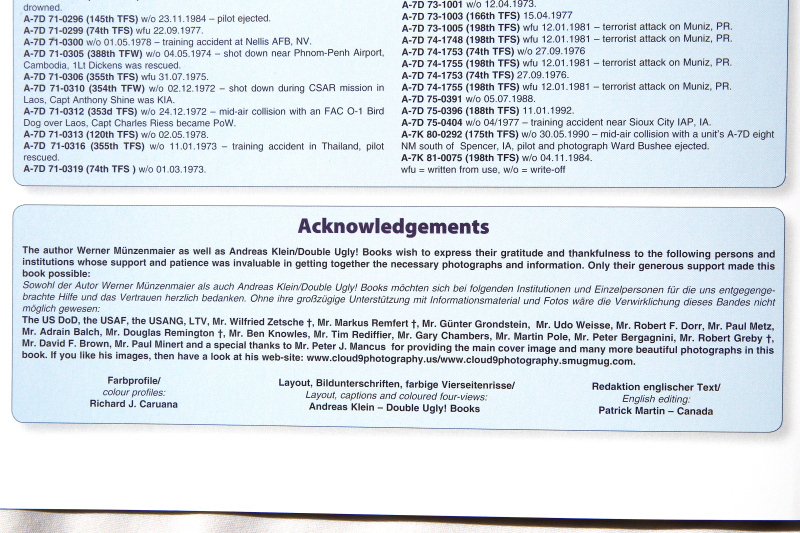 27: CLOUD 9 is a meaningful, heart felt, on-line, tribute to those who contributed to the Cause of Liberty and Freedom. CLOUD 9 will mean many things to many people. To aircraft designers, builders, test pilots, air crews, maintenance personnel, service-men and women, our airplane pictures generate nostalgia at seeing again planes once flown and almost forgotten. "Thank you!" for your ingenuity, your hard work, your commitment, your courage, your steadfastness, and your exemplary service to the nation. You are national assets and a credit to yourselves. To aircraft power plant designers, builders, and mechanics, CLOUD 9 is a convenient source for excellent airplane pictures of your work, e.g., afterburners in dynamic action. FACTOR NO. 28: CLOUD 9 show cases and promotes talented people who contribute and cooperate with us. At CLOUD 9, you get to enjoy some of the best work of numerous creative people. If you are creative and want to have your work showcased on CLOUD 9, please call me, Peter Mancus, to discuss, at (707) 824-1884. FACTOR NO. 29: I am full of energy, infectious enthusiasm, and drive. It is easy to feel this way. I love what I am doing. I am proud of CLOUD 9 prints. 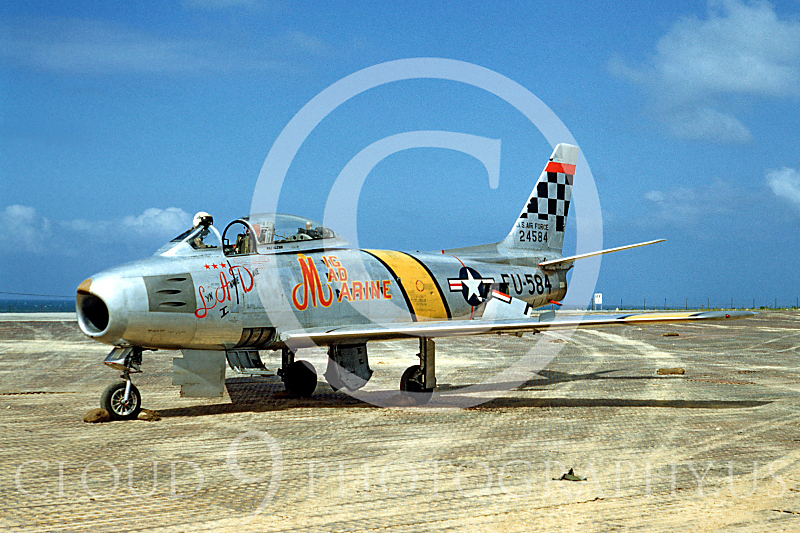 I love CLOUD 9's images, and I believe CLOUD 9 prints are of highest quality. FACTOR NO. 30: CLOUD 9's mailing tube is reusable. You can re-use a CLOUD 9 tube to safeguard important documents or to mail something to some one. FACTOR NO. 31: I offer you two things: 1) "Visual Candy" [prints for a price] and 2) "Brain Protein" [healthy intellectual food, in the form of intelligent commentary, on my Blog, and I offer this Brain Protein for free]. "The Almighty Dollar" is not my only motivation. 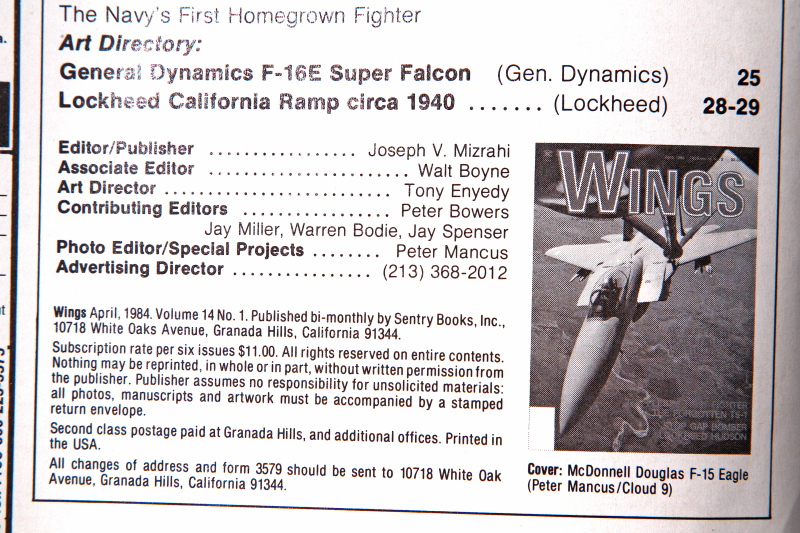 In addition to selling pictures, I have a great cause to promote, namely, the U.S. needs to return to its roots and embrace constitutionalism (functioning with fidelity to its Constitution's commands, per its expressed text, as written), and I have a vision and a goal which are important to me, namely, the U.S. Armed Forces, America's elected and appointed officials, and the American citizenry should function with unity, in harmony, in full compliance with our Constitution's commands. I am proud of that core orientation. I declare it with apology to no one, without any reservation whatsoever. FACTOR NO. 32: By including "Brain Protein" on the CLOUD 9 Blog, I am reaching out to intelligent people of the world, of good will, especially women-American women and women of the world, and I urge them to please do the following: 1) look at CLOUD 9's pictures anew, 2) ponder what it means to be a human being, 3) ponder the value and the sanctity of human life, 4) ponder the value and import of Human Dignity, Individual Liberty, Self-Determination, and the Constitutional Rule of Law versus Rule of Law, 5) ponder what are the real threats to your existence and your enjoyment of your life . . . and your loved ones', too, 6) read carefully what is posted on CLOUD 9's Blog, 7) think critically and carefully, and 8) do your best to teach your children to respect human life, to question authority, to refuse to obey misleaders, and to advance "civilization", namely, to re-draw anew a better, stronger, wiser, clearer line that separates Governments' Powers from Peoples' Rights. My intent here is to do my reasonable best to be a force for good, to promote peace and harmony among the world's peoples, to stimulate critical thinking, to be an information generator, to be an intelligent commentator on current event issues, to be a problem solver, to crystalize feelings, to motivate, to initiate a dialogue, and to give you, the CLOUD 9 customer, takeaway ideas of value, for free. I hope this bonus feature of CLOUD 9 delights you, even if and when you vehemently disagree with some of the content of this feature. Ido not know what are CLOUD 9's customers' core values and beliefs. I imagine, however, that they are varied and inconsistent, especially since CLOUD 9, via the Internet, is available to anyone with Internet access around the world, and the world is comprised of people with different cultures, values, and beliefs. I do know, however, what happened before I was born, where I stand on history's time line, what is "the Big Picture"-at least as I understand it, what I believe, and why I believe what I believe. At the risk of alienating some CLOUD 9 customers and, therefore, motivating them to not buy a CLOUD 9 print, to initiate a dialogue and to start to stimulate critical thinking, I declare below, in summary form, some of my core beliefs. in the nuclear age, with a growing world population competing for more scare food, clean water, clean air, and energy, it is imperative that the people of the world mature emotionally and intellectually and learn to co-exist peacefully, share the world's resources amicably, and stop killing one another over one or more "isms" or causes. Anyone who rejects what I declared above in A) to AL), inclusive, is well advised to suspend final judgment and think anew. As time permits, the above core beliefs will be discussed in detail on the CLOUD 9 Blog. At a minimum, I hope readers recognize my authenticity, appreciate my honesty, and accept my representation that I am trying to be a force for good-for the betterment of all humanity. As I ponder what I wrote, and as I reflect upon the human condition and thousand of graphic, gut wrenching pictures of women from around the world who understandably cry, rail, and mourn over the death of a relative, and how their anger fuels more conflict and contributes to more homicides, I feel a compelling need to morph CLOUD 9 into more than just an Internet pretty picture site, to share my opinions about controversial subjects, and to use certain CLOUD 9 pictures to illustrate my opinions to underscore the merit of my opinions, with one overriding purpose in mind: to stimulate people around the world to comprehend that their shared humanity overrides most, if not all, "isms", and killing one another to try to advance one's preferred "ism" is counter-productive and is best avoided. While I am fascinated by modern military hardware and while I admire, immensely, with some exceptions, the U.S. Armed Forces and anyone else in any nation's military on the side of Individual Liberty, I loathe war, and I loathe homicidal acts, even in war; however, I do embrace the idea that killing is often necessary and justifiable. Nevertheless, I prefer non-violent conflict resolution. Being a male, it is impossible for me to fully understand what it must be like for mothers to carry a child for nine months, to give birth, to sacrifice for a child, to nurture a child, to teach a child, to see a child grow up, and to watch a child leave home, sometimes to fight, injure, and kill other women's children, often from a different land, culture or religious persuasion, to promote some "ism" or cause. I observe that in World War II Japanese women encouraged their sons to become Kamikaze pilots and American women encouraged their sons to shoot down Kamikaze pilots. One group fought to win by committing suicide and the other fought to win by staying alive and killing the opposing foe. Mothers and their children from different cultures had conflicting values and beliefs. Currently, many Muslim mothers, apparently, encourage their children to go out and blow themselves up and, in the process, to kill as many Muslims and Americans as they can, while Americans only want to be a force for good, to help, to protect, stay alive, and defend against Muslim suicide bombers. It is well known that historically, the world's peoples have excelled at killing each other to promote an "ism". Sometimes, the basis for the killing is justified, allegedly, on grounds that appear to be frivolous or insignificant. For example, in Russia, for a few decades, tens of thousands of Christians killed each other because they could not agree on how to make the sign of the cross! I, as a sweeping generalization, with reservations, have a lot of respect for women. In law school, for example, my class of about 150 students had approximately 5 female students, and, as a group, I think those 5 females were superior to most of the 145 male students, including myself. Also, when given a choice, I often select a female service provider, including professional services, such as a female family physician. Here, I am making a special appeal to women, reaching out to them, urging them to read what is on the CLOUD 9 Blog and to buy CLOUD 9 prints. I hope they use these prints to teach good values to their children and as gifts to a relative or friend who deserves favorable recognition for honorable service as a member of the U.S. Armed Forces. I appeal especially to American women because, in the United States, women 1) now control more than half of the private wealth, 2) earn more advanced degrees, 3) are responsible for the bulk of household purchases, 4) control a great deal of corporate spending, 5) read more than men, 6) have primary child nurturing duties, 7) vote more often than men, 8) love their fathers, mothers, brothers, sisters, sons, daughters, uncles, and aunts, etc., many of whom are--or were--in the U.S. Armed Forces, 9) know that their loved ones in the Armed Forces are trained to kill and are subject to being killed by another woman's child, all in the name of some "ism" or cause, 10) have or share primary responsibility for teaching their children good values, and 11) do most of the gift buying for the significant men in their lives, and CLOUD 9 has a lot of product that most men-and many women, too--would love to have if they knew we have what we have. I hope I am not hollering into a void, and I hope I am not coming across as being too preachy. 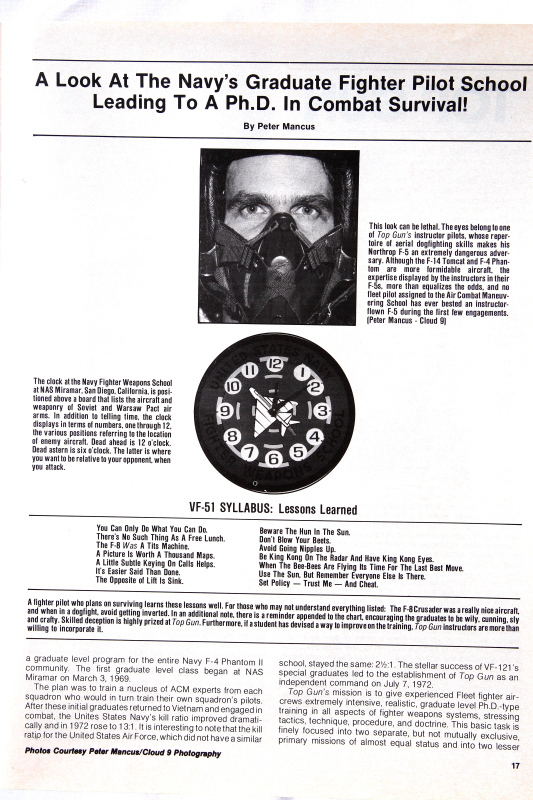 I also hope that if and when someone reads the opinions shared in the CLOUD 9 Blog that if and when they encounter "mental vapor lock" because they are outraged over any of my opinions, that they continue to read and ultimately decide, upon careful deliberation, that my opinions have substantial merit and cannot be easily dismissed. For the reasons stated, I cordially invite-and respectfully implore-CLOUD 9 visitors to poke around the CLOUD 9 Blog and to challenge themselves to do something different, e.g., read this Blog's politically incorrect content, feed your brain some CLOUD 9 "brain protein", and enjoy CLOUD 9's picture galleries-just for themselves and also in terms of their historical context and relevancy to your life. I appeal to women in particular because I believe women are information hungry, are visually oriented, want authenticity, do not want to be condescended to or ignored, are socially conscious, can absorb information on many levels in a substantial amount at one time, are inquisitive, and many women and I share some important core mutual values and interests, one of which is they want their children to outlive them, they do not want their children to die in some foreign land fighting in some gut-wrenching war, and they also want their children to live long, happy, healthy, thriving lives, without having to fight in wars and risk being killed or having to kill another woman's child or children. I do not know of any site on the entire Internet that has CLOUD 9's approach and specific appeal, to women in particular, and to the people of the world, namely, to look at the pictures on CLOUD 9 and to think anew, beyond one's cultural values, beyond national heritage, beyond national animosities, and beyond hostility toward the peoples of another nation or of a different race, culture, or religion, for any reason. Earth is not that big. Life [human, animal, and plant], the atmosphere, and the environment are fragile. Natural resources are scare. Populations are growing. Competition for scare resources is growing. We must, therefore, learn to push beyond traditional conflicts and get along with one another-peacefully and amicably, with a genuine mutual shared respect and appreciation of one another and the wonderful, magnificent differences among the world's diverse people and cultures. As a practical matter, it is simple: It is far better to be each other's friend and customer than it is to be each others' enemy and at war. War is expensive. People get killed in war. Expensive things get blown up in war. People are not fungible. Things are not easily replaced. Along the way, Americans need to come to grips with this reality check: They cannot spread freedom abroad and simultaneously abandon it at home at home, at least not without appearing to the world as being ridiculous and hypocritical. Simultaneously, non-Americans need to learn that while Americans have stumbled and made ill-advised decisions, to their credit, they have often spent a nation's treasure in terms of money and the most important of currency-human courage, human sacrifice, and human blood-in pursuit of the cause of freedom from oppression, for Americans and non-Americans, too.